The Xbox Kinect 1.0. Yes I’m talking about Microsoft’s first attempt at motion controls on the fantastic Xbox 360 console. The device actually sold pretty well to begin with people seemed to buy into Microsoft’s marketing for the device for about 5 minutes and then people left it on the side lines only to pull it out from the dusty corner of the living room when a new entry in the Dance Central series released. Then Kinect 2.0 happened and no one cared, so the real horror here is Kinect’s failure to capture an audience. Of course you’d have seen the title and you know that’s not what we’re here to talk about. No horror fans, today we are going to talk about the reason I kinda wanted to buy a Kinect for the Xbox 360 in the first place a little Sega title called Rise of Nightmares. 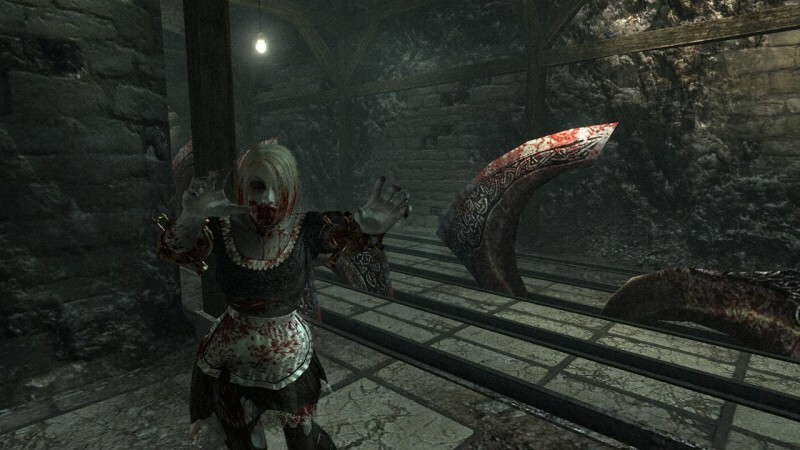 Rise of Nightmares to me is House of the Dead for the Kinect. Now I know that’s an incredibly bold statement to make since the House of the Dead series is just light gun zombie shooting bliss and Rise of Nightmares, well its a Kinect game and that just makes people just groan generally. We’re gamers right? we don’t like standing up and flailing our arms around we like to sit on sofa and be lazy. Unless of course your like Fred and you stand up to play games anyway in which case buy this game and enjoy. Rise of Nightmares is a first person game, you have to stand up in this game and have a adequately sized living room to make the most of the experience (unless you fork out the extra dosh for a kinect accessory which zooms in the camera in a smaller area). To move forward in the game you literally have to put one foot in front of your standing position. To go backwards you put a foot behind and you turn by adjusting your shoulders. The game does allow areas for the game to move you automatically but its an interesting design to avoid an on rails experience and allows the player to explore the areas at their leisure. Attacking is pretty much an arm flapping affair- you can punch stab, bash and use two handed weapons as required. You can also guard by putting your dooks up as well as kick with your feet. So you can see how this game can be quite the workout. The gestures do require some exaggeration but if your whiling to learn the mechanics there’s quite a bit of fun to be had, if your an unfit coach potato like me this game is enjoyed in moderate sessions. Your regular enemies are these Zombie like creatures that look partially mechanical. They’re appropriately slow enabling you to exact an appropriate movement to take them down. You will also be attacked by multiple targets but the camera can be put in an automatic state so you don’t have to think about movement and attacking at the same time. Rise of Nightmares feels to me like the Evil Dead version of a horror game. What I mean by this is the game is not particularly scary, in fact its quite goofy in places adding to its charm. However, there are some genuine moments of horror genius in Rise of Nightmares. The game has a sort of nemesis character wandering around called Ernst who you need to stay completely still to avoid detection. Failing this will result in a gory death for yourself which feels odd when you’re the controller. I get quite immersed in games so I felt like I was actually being attacked (who needs VR?). The extent of Rise of Nightmares horror is more gore and cheap jump scares which you see coming a mile. The story is very basic you play as Josh, your wife has been kidnapped so go rescue her. Don’t worry some random NPC characters accompany you to act as cannon fodder along the way. After all we can’t have the player dying all the time in this game. The game has you hoping from multiple locations in Romania. As someone who has visited this country I’ve never seen the areas that look like the scenes in this game but that’s just me being nit picky. Rise of Nightmares is dumb gory fun that I highly recommend you enjoy with someone else in the room with you. Yes, the Kinect is not perfect but if this game used a controller I really don’t think it would stand out at all. Its thanks to the Kinect and the motion controls, that this title is so unique and certainly a worthy entry for the horror obscura. This game is still pretty cheap to find these days as is the Kinect so go get it and have some arm flapping fun.